There's no two-ways about it, the Universe is an extremely big place! And thanks to the limitations placed upon us by Special Relativity, traveling to even the closest star systems could take millennia. As we addressed in a previous article, the estimated travel time to the nearest star system (Alpha Centauri) could take anywhere from 19,000 to 81,000 years using conventional methods. The study, which recently appeared online, was led by Dr. Frederic Marin of the Astronomical Observatory of Strasbourg and Camille Beluffi, a particle physicist with the scientific start-up Casc4de. They were joined by Rhys Taylor of the Astronomical Institute of the Czech Academy of Science, and Loic Grau of the structural engineering firm Morphosense. Their study is the latest in a series conducted by Dr. Marin and Beluffi that address the challenges of sending a multi-generational spacecraft to another star system. In a previous study, they addressed how large a generation ship's crew would need to be in order to make it to their destination in good health. They did this using custom-made numerical code software developed by Dr. Marin himself known as HERITAGE. In a previous interview with Dr. Marin, he described HERITAGE as "a stochastic Monte Carlo code that accounts for all possible outcomes of space simulations by testing every randomized scenario for procreation, life and death." From their analysis, they determined that a minimum of 98 people would be needed to accomplish a multi-generational mission to another star system, without risks of genetic disorders and other negative effects associated with inter-marrying. For this study, the team addressed the equally important question of how to feed the crew. Given that dried food stocks would not be a viable option, since they would deteriorate and decay during the centuries that the ship was in transit, the ship and crew would have to be equipped to grow their own food. This raises the question, how much space would be needed to produce enough crops to keep a sizeable crew fed? 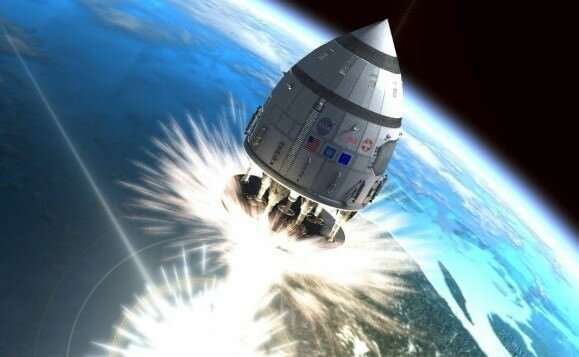 "The heavier the satellite, the more expensive it is to launch it into space. 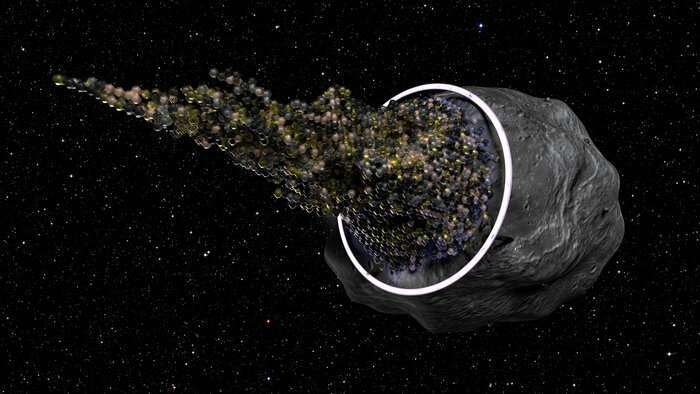 Then, the larger/heavier the spaceship, the more complicated and resource-expensive will be the propulsion system. In fact, the size of the spaceship will constrain many parameters. In the case of a generation ship, the amount of food we can produce is directly related to the surface area inside the ship. This area is, in turn, related with the size of the population aboard. Size, food production and population are in fact intrinsically connected." To address this important question – "how big does the ship need to be?" – the team relied on an updated version of the HERITAGE software. As they state in their study, this version "accounts for age-dependent biological characteristics such as height and weight, and features related to the varying number of colonists, such as infertility, pregnancy and miscarriage rates." Beyond this, the team also took into account the caloric needs of the crew in order to calculate how much food would need to be produced per year. To accomplish this, the team included anthropomorphic data in their simulations to determine how much calories would be consumed based on a passenger's age, weight, height, activity levels, and other medical data. "Using the Harris-Benedict equation to estimate an individual's basal metabolic rate, we evaluated how many kilo-calories must be eaten per day per person in order to maintain ideal body weight. We took care to include weight and height variations to account for a realistic population, including heavy/light corpulence and tall/small people. Once the caloric requirement was estimated, we computed how much food geoponics, hydroponics and aeroponics farming techniques could produce per year per kilometer square." "We found that, for an heterogeneous crew of, e.g., 500 people living on an omnivorous, balanced diet, 0.45 km² [0.17 mi²]of artificial land would suffice in order to grow all the necessary food using a combination of aeroponics (for fruits, vegetables, starch, sugar, and oil) and conventional farming (for meat, fish, dairy, and honey)." These values also provide some architectural constraints for the minimum size of the generation ship itself. Assuming the ship were designed to generate artificial gravity by centripetal force (i.e. a rotating cylinder) the would need be a minimum of about 224 meters (735 feet) in radius and 320 meters (1050 feet) in length. 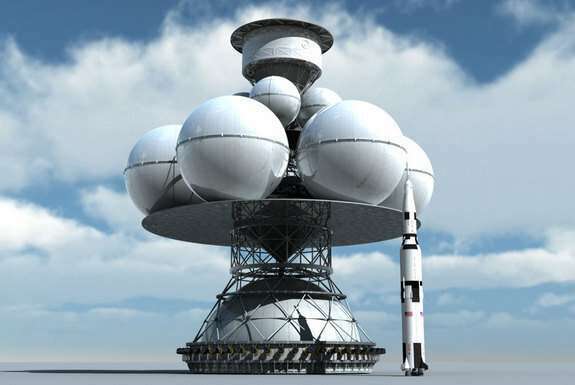 "Of course, other facilities besides farming are necessary – human habitation, control rooms, power generation, reaction mass and engines, which make the spaceship at least twice larger," Dr. Marin added. "Interestingly, even if we double the length of the spaceship, we find a structure that is still smaller than the tallest building in the world – Burj Khalifa (828 m; 2716.5 ft)." For aficionados of interstellar space exploration, and mission planners, this latest study (and others in the series) are highly significant, in that they are providing an increasingly clear picture of what the mission architecture of a generation ship would look like. Beyond merely theoretical propositions of what would be involved, these studies provide actual numbers that scientists may be able work with someday. This, Marin indicates, will be the subject of their next study. "In deep-space (far away from planets, moons or large asteroids), water might be very difficult to collect," he said. "Then the resources on-board might suffer from the lack of water. We must dedicate our future investigations to solve this issue." As with most things pertaining to deep space exploration or the colonization of other worlds, the answer to the invariable question ("can it be done?") is almost always the same – "How much are you willing to spend?" There is no doubt that an interstellar mission, regardless of what form it might take, would require a massive commitment in terms of time, energy, and resources. "How do you keep them down on the farm? Once they've seen Gay Polaris?" The biggest problem is one of choice: only the first generation will choose to be on the ship. All future generations will be trapped by a choice someone else made for them. That's dangerously close to slavery, is it not? How do you deal with those who resent being born in space? You can brainwash them from birth, but when has that ever been a 100% effective solution? So what happens when a bunch of depressed, hormonal teens decide they aren't okay with everything and they're going to mutiny, take over the ship, kill any dissenters, and head back to Earth? Is someone seriously thinking that some dystopian scenario like constant brainwashing and executing all dissenters is going to work? Or keeping everyone in a coma and having robots handle inseminations, births, and corpse disposal? There's a very good reason that submarine service is 100% volunteer, and that is that people have to choose to put themselves in harm's way to be even partially reliable. Wake up, folks. In previous articles of unfettered optimism? When I attempted tp point out the short-comings of such sloppy planning? Other readers became incensed that any one would throw cold water on their dreams of ravishing green Orion slavegirls. People. whom I usually respect for cogent comments about other issues? Were frothing at the mouth at my suggesting they learn from successful mass colonization efforts such as the Mormons. No. they wanted to emulate Cortez & the Pizarro brothers. I warned that all they'll accomplish is cannibalizing crew as at the Jamestown & Plymouth colonies! I had suggested they talk to Naval submariners & commercial deep-sea divers. Most important they needed to learn about logistics. But the twits whined that their comicbooks promised them when they got into trouble a hundred million Km from Earth? Mighty Mouse will show up to save the day! Then they start babbling favorite Sfx & CGI from TV & movies. Death by radiation-induced genetic malfunction will be rampant. Spontaneous abortion and stillbirths will limit or eliminate crew replacement. A graveyard vessel filled with corpses will arrive at the destination. Not that I think a generation ship would work Doc and rrwillsj, but aren't those technical problems rather than conceptual flaws? The way I see it your arguments are an issue of scale. I was born on this planet of parents who did not consult me about whether or not I thought this was a good idea, and due to my limited resources I can not leave Earth. I happen to be on a much larger space ship some number of magnitudes larger than any proposed ship. Is there no size of ship that could offer enough varied experience to keep new generations occupied with what they perceive as a full life? Not to mention the whole concept of children leaving their family to make their "own" way is a novel concept no more than a few hundred years old at best. For the majority of human history people were born on a farm, never traveled more than a few towns over, and died on said farms after continuing the cycle by having their own offspring. Build a bigger ship, no? Rhugh, I hope they would consider radiation exposure before launching into interplanetary space let alone interstellar. I think the biological Island effect would be what would get them. Viruses and bacteria mutate much faster than larger more complex organisms. They would have a hell of a time keeping crops, and I don't know if my answer in the previous comment would work. I have no idea how large a ship it would take to effectively mimic Earths very rich and deep biosphere to the extent that a population (all life including bacteria, and whatever plants and animals are brought along) could maintain homeostasis. Kim Stanley Robinson's book Aurora was very illuminating in regards to the many many possible things that could go wrong with such an endeavor. rrwillsj I know i know its science fiction but they the author essentially agreed with you so its gotta be worth something no!? In my opinion, there are two major hosts of problems. The first host will be tactical, technical issues. if we can't prevent or at least resolve these technical failures here on Earth? It'd be a bloody damn miracle to change a flat-tire in Outer Space! The greatest problem, the most intractable? Is the issue of Gravity. It must be proven, before Human lengthy space travel will be practical, that biological organisms can thrive, reproduce & sustain over multiple generations in micro-to-zero gravity. If eventually, there is incontrovertible evidence Biology is an Earth function & has no place in Space? Will people be mature enough to accept the reality? That space travel will have to be experienced vicariously? Through drones & robots? Yeah? Well, I didn't think so either. Artificial gravity is one of those bad ideas that will have to be proven & re-proven. Over & again, at great expense. As a futile endeavor. The second host of problems will be social & psychological. That our society suffers from the delusion that "conquest" is a sustainable form of "progress". No matter how many times Humanity's nose has been rubbed in the self-destructiveness of such an evil addiction. Then there are the perpetual adolescents who think repeating failures, endlessly, will some how create something they can pretend is success. "Technical Problems" are not a fault of the workers or their dependents. Replacing workers with robots, will not resolve the problems of productivity or maintenance. In actuality,. "technical problems" are a Management issue. As a failure of Management to manage the all too predictable failures. As a society we refuse to consider "Why". "Faje it till you make it" is the new American slogan. No matter gow dusastorous the consequences. Why waste resources & lavishly spend with liberal abandon our wealth to accomplish so damn little? Salute from behind the iron curtain. In fact, as You're able to prevent air leakage? Only robots, not humans being! Robots must reproduce themselves. The biggest problem is the source of energy. Nuclear fuel will break down during the flight. The thermonuclear reactor is not built yet. I do not see producing energy as a major problem. If we are sensible enough to use robots? Why waste energy on speed? We are not talking NASCAR here. Efficient & methodical will be the keys to success. Aside from the multiple issues of habitat atmosphere & environments. Biology & machinery produce heat as waste. In the vacuum of Space, disposing of the excess heat is a serious problem. For safety reasons, a multiple series of methods will need to be developed. Producing energy will be the simple beginning to the complicated process of how to collect, control, store regionally, distribute regionally, store locally, distribute locally, restore unused excess & salvaged waste energy & dispose of unsafe levels of excess. All this, safely, efficiently & with built in extra in case of disaster or other unpredictable events. It is not enough to build a better mouse trap. You have to be thinking ahead when the better mice catch up too you. No, artificial gravity is simple, just rotate the ship. Plenty of problems with long term space travel, artificial gravity aint one of them. Scaling up the ship would help a lot with both radiation protection and also long term sustainability. Interstellar travel is hard as it is, especially with crew. We are not going to do it with a small ship. A city-sized one will be required. SM, if you have invented some miracle material that can withstand the stress & torque of the usage you are describing? Run! Do not dawdle, your way to the US Patent Office. Before somebody beats you too it. Don't forget to include testable samples! As for dealing with internal Coriolis forces & inertia? One word "turbulence", If you have those minor details figured out? Please publish the results of successful tests. A scaled up habitat-ship is a large target for cosmic & other hard radiation. Expecting the structure to protect the contents is just trapping the cascading radiation inside the vessel, with you. There are two viable options. Well three, if you are willing to pay for the hermit crab strategy of using a disposable outer shell? Is gold-foil, draped over the outside of your vessel. It may reflect or capture a lot of the varieties of Space radiation. Or invent a shielding energy-capture mechanism. Thrifty. The 3 acre Biosphere was not large enough for 8 people for more than 2 years without pumping in extra oxygen, something you can't do past the Oort cloud. The idea of containing humans for centuries like lab rats is a fools errand. This is not a journey intended for biological humans. Wasn't the problem with biosphere (2?) something to do with CO2 from the concrete? "As we addressed in a previous article, the estimated travel time to the nearest star system (Alpha Centauri) could take anywhere from 19,000 to 81,000 years using conventional methods." After arriving at AC, then what? There are no habitable planets there......I guess on to the next star is that it? Another 80k lyrs worth of travel time? The New Horizons presently travels at 36,5k mph. One light-year is 5,878,499,810,000 miles. it would take New Horizons 18,500 years to travel one light year, 75k to AC. Anything longer than 28,000 years would miss the closest approach of Alpha Centauri to our solar system. After than, Alpha Centauri gets further away. Minimum velocity to reach Alpha Centauri is very roughly 50,000 mph. Slower than than and Alpha Centauri will simply pass you by. "Footfall is a 1985 science fiction novel by American writers Larry Niven and Jerry Pournelle. The book depicts the arrival of members of an alien species called the Fithp that have traveled to our solar system from Alpha Centauri in a large spacecraft driven by a Bussard ramjet. Their intent is conquest of the planet Earth"
-Earthers collect earths nukes in secret and build a daedalus class ship out of shuttles and ICBMs and battleship gun turrets and misc parts and kick their elephantine asses. Glorious. If you think about this old meme instead of just repeating it you might realize that everybody is trapped right where they are with limited choices and options. -and wait for the quakes. What a trooper. George doesnt like anything nuke-powered. take over the ship, kill any dissenters, and head back to Earth? Hey why dont you write a novella? Add it to the extensive list. First explain how you turn such a ship around in mid flight. "Daedalus was to have obtained an eventual cruise velocity of 36,000 km/s or 12% of light speed from over 700 kN of thrust, burning at a specific impulse of 1 million seconds. Travel time to flyby at destination would be approximately 50 years"
Math is not Otto's strong suit, but try to run the numbers and see what you come up with. AC is going to pass us by in about 28,000 years at a distance of about 3.2 light years. If you don't get there by then, you will have to intercept AC at a greater distance while it is receding. To meet AC at its closest approach you would have to be traveling about 77,000 mph. However, I seem to recall it is possible to intercept AC at down to around 50-some thousand miles per hour as it is receeding. Any slower than that and you will simply miss the encounter. Similarly, this is kind of like walking 2 miles to catch a train departing at 8 am sharp. If you have 2 hours to get there, you cannot walk slower than 1 mph or you will simply miss the train's departure. What does that even mean with regard to reaching Alpha Centauri? "Musk space tesla" is not leaving the solar system so it is not at all clear how that is related to traveling to Alpha Centauri. How about a link instead of your weak insults? As for dealing with internal Coriolis forces & inertia? You do not need a miracle material. Dealing with Coriolis is trivial, make your radius of rotation at least few hundred meters, and Coriolis is insignificant. Considering that any realistic design is city-sized, this condition is trivially true. As for radiation, you are once again off the mark. You need a several meters thick layer composed of light atoms on the outside. Water, fuel or plastic. That is enough to mitigate the danger of cosmic rays. SM, lookup turbulence & pipelines. When you invest that kind of money? There are no trivial forces to blithely disregard. U don't know if you are old enough to have lived in an building with steam heated radiators.? If not, search through old movie databases & I'm sure you can find several comedy flicks loudly banging away at the subject. As for petty Coriolis? There is no such critter as "artificial gravity. There is Gravity as a Constant of Mass or there is not mass & therefore, no gravity. Being in a big, rotating pipe you experience Acceleration. DO NOT confuse with Momentum. Even in an rotating airless pipe, the forces of Momentum caused by Acceleration will apply some harsh lessons. A real "Come to jeebus moment!" Acceleration moves you along, Momentum keeps you moving. Then Inertia is what smashes you into whatever is in the path of your trajectory, Just like a bug splattering on a windshield! I don't give a flaming fart what fabulisms the comicbooks, CGI & Sf/x promise you. Off Earth is as harsh a place for survival as the very worst, most deadly environments to be found in. on or under the Earth. Back to the rotating pipe. You have accelerated the pipe to spinning. Pretend the stresses are not ripping it apart. Fill it with air. Remember, no art-g. What is the ring velocity? That air will not remain unmoving. Now you get to experience the Coriolis turbulence. & for fun, please to explain how you are getting around? As the floor goes one way & you want to go that away? Back to Gravity. You can shut off, reverse, &/or direct all forms of energy. Except Gravitational Attractant Force. It does not wear out, use-up, shut-down, reverse or direct. It never runs out of fuel. It does not go quietly into the eternal dark night. Gravity in the dark dead universe will be what is left after everything else, all the other Forces are long extinct. It is getting stronger . I can tell. It started sapping the spring out of my step, and now has slowed me down going upstairs. -And yet I know the relative difference between 50,000 miles per HOUR and 36,000 km per SECOND. Do you? And re the tesla, we are already propelling things faster than 50kmph. Otto, I wrote "Minimum velocity to reach Alpha Centauri is very roughly 50,000 mph." What part don't you get? I agree with the size that you're suggesting. City-sized might give 500 Souls aboard a bit more room and not feel enclosed as though in a tin can or a submarine. That would go a long way toward preserving their mental health.